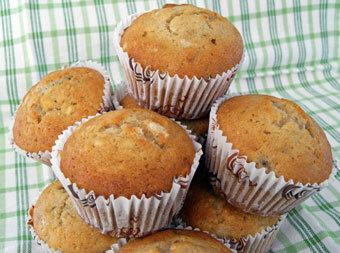 A low fat banana muffin recipe that you will want to make again and again. These low fat banana muffins contain no butter or egg yolk. Made instead from egg white and yogurt, they are unbelievably light and moist. Seriously, you won't be able to tell the difference between these and full fat ones. This means you'll be able to enjoy as many of these as you like, completely guilt free. Line a 12 hole muffin tin with paper cases. Preheat the oven to moderately hot 190°C / 375°F. Sift together the flour, salt, baking powder, baking soda and cinnamon into a large mixing bowl. Add the sugar. Stir to combine the ingredients. Peel and mash the bananas with a potato masher until soft and mushy. Separate the eggs and whisk the egg whites until slightly frothy. Make a well in the center of the flour and add the bananas and egg whites. Add the oil, yogurt and nuts then fold through with a spatula until the ingredients are just combined. The mixture should still be quite lumpy. DO NOT overmix. This will result in your muffins turning out tough. Spoon evenly into a 12 hole muffin tin. Bake for about 20 minutes or until golden and firm to the touch. I used a vanilla flavored low fat yogurt for this low fat banana muffin recipe which only added to their flavor. But you could use banana flavored yogurt for a richer banana taste. Don’t throw away the left over egg yolks, keep them to make a delicious dessert.